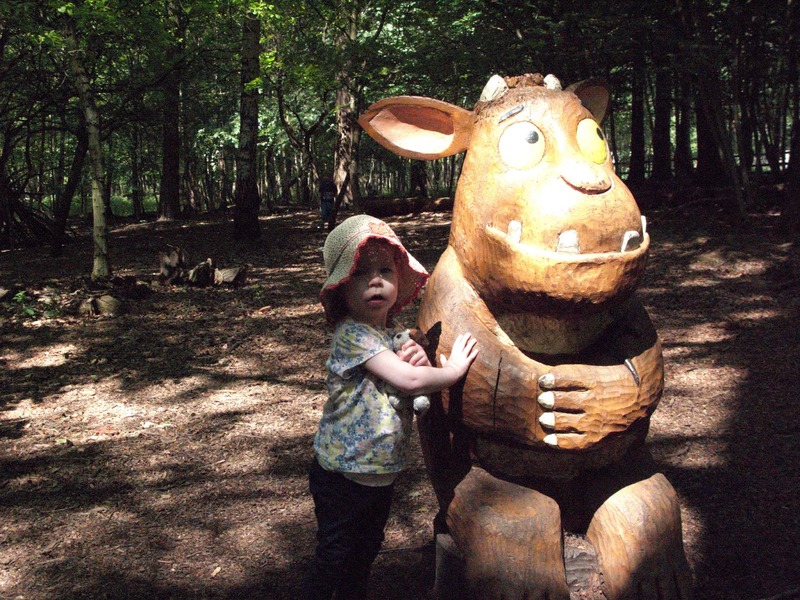 One sunny Sunday we headed to Thorndon Country Park in Essex to hunt for the Gruffalo and his friends. It's a lovely huge park and wooded area that makes you feel happy to be alive, you can run, walk or skip your way around, it doesn't matter. We got to the park around 10.30am and parked easily in one of the two large carparks and paid our £2.50 parking fee. Then off we went with our picnic into the woods, I'd read online that you could pick up a Gruffalo map in the gift shop for 50p. It's a great map that shows you where each character from the Gruffalo is situated, the characters are set far enough apart that you aren't swamped with people but at the same time they aren't too far apart that Bubba lost interest or got achy legs. The carved characters are amazing and even as an adult its a great thrill when you see them through the woods and we all had our pictures taken at each one. Half way through the hunt we stopped at the picnic area and ate our sandwiches and then on we went. It was a great morning out for us and the weather was on our side which made it even more magical as the sun shone through the trees. My only advice would be to get there early because as we left (around 1.30pm) they had shut the park to more visitors because the carparks were over flowing but again it was a bank holiday weekend so I'm not sure if it gets that busy usually. It should because I would highly recommend going if your little ones love the Gruffalo or you enjoy a walk in the woods. Erm...when did she become a toddleteen?? ?